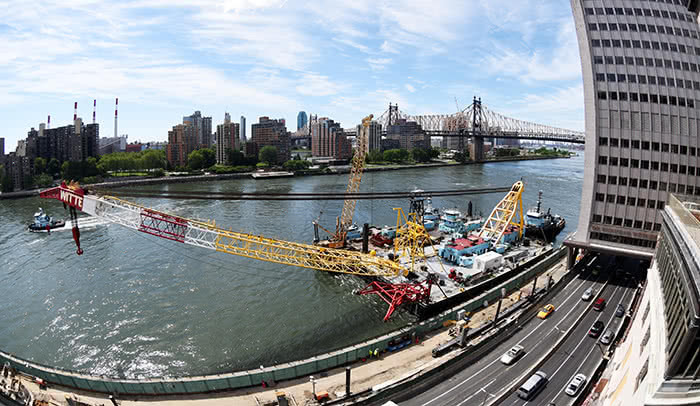 Ready to lift: The barge-mounted crane that will lift the prefabricated modules of the River Campus into place over FDR Drive arrives at Rockefeller. A new phase of the project to extend the Rockefeller University’s campus toward the East River begins tomorrow at midnight, when the first of 19 prefabricated sections of the extension’s structural skeleton will be lifted into place over the FDR Drive by one of the largest barge-mounted cranes on the East Coast. The ambitious $500 million extension project, the Stavros Niarchos Foundation–David Rockefeller River Campus, is due to be completed in spring 2019, and will add 160,000 square feet of space, including modern, modular laboratories to replace the research university’s aging facilities. It will also include a green, landscaped roof that will add two acres to the university’s existing 14-acre campus. The two-story, three-block-long Marie-Josée and Henry R. Kravis Research Building will be the centerpiece of the project. The lift Tuesday night is the first of 19 that will be conducted this summer during overnight hours. To help minimize disruption for neighbors and commuters on the FDR Drive, the steel superstructure has been prefabricated off-site as a series of interlocking modules. Each of these modules, some of which weigh as much as 1.5 million pounds, will be brought from Keasbey, New Jersey, to the Upper East Side via barge, hoisted into place, then bolted to support columns that have already been constructed along both sides of the FDR. For safety reasons, the FDR Drive and East River Esplanade will be closed during lift operations. The installations have been carefully planned to take place when currents on the East River are at their calmest and vehicular traffic is at its lightest. All road closures will take place between 12:30 and 5:30 a.m. (6:30 a.m. on Sundays) and traffic coordinators will be placed at key intersections between 42nd and 96th Streets to keep vehicles moving along detour routes. For up-to-date road closure information, visit the New York City Department of Transportation’s Weekly Traffic Advisory page.